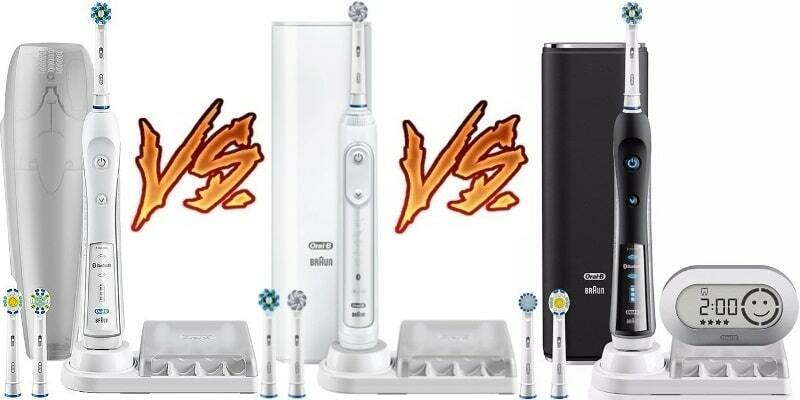 Comparing the Oral B Pro 5000, 6000 & 7000: What's the Best Choice? 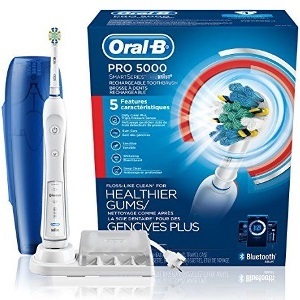 Comparing the Oral B Pro 5000, 6000 & 7000: What’s the Best Choice? When you’re comparing Oral B toothbrushes, you’re bound to find yourself a bit confused. The toothbrushes are made by a company that puts great features into all their models. The Oral B PRO 5000, 6000, and 7000 are close to perfect for your needs. In this comparison, though, we’re going to try to give you all the reasons you should choose each model. We’ll cover the brushing modes, brush heads, and features that will give you a better brushing experience. There are features and benefits that are available for each type of toothbrush. As you’re reading, it’s best to consider what you need for you as well as your family. The right brush head, features, and modes can give you varied benefits, but they’re all great options. It’ll depend on your needs. At the end, we’ll make our recommendation. The Oral B 5000 has an oscillating, pulsating, and rotating head to break apart plaque buildup and remove it. Once plaque is removed from the teeth, you’ll have a healthier mouth. The 5000 has a Floss Action brush head that has bristles focused on providing a floss-like clean. The shape and movement of the head is inspired by what dentists use in their offices. Along with an oscillating brush head, there are 5 brushing modes to give you the best clean possible. There’s a Daily Clean option for everyday cleaning. Gum Care focuses on stimulating and healing the gums. Whitening mode will polish the teeth and remove yellowing. Deep Clean delivers a clean that goes beyond your daily brushing. It rivals the clean you’ll get from a dental visit. Lastly, you get a Sensitive mode for those who need a lighter touch. There’s a pressure sensor for when you’re applying too much while brushing. Harsh, aggressive brushing can lead to serious gum problems. Eventually, gums could begin receding due to the bristles scraping along the gum line. This kind of overbrushing is eliminated with the sensor. The Bluetooth app with the Oral B PRO 5000 leads to healthier brushing practices. The toothbrush links with the app in real time to provide feedback on brushing habits. It’ll tell you whether you’re brushing correctly. It’ll show you what areas of your mouth haven’t had adequate time. This data can be brought to the dentist, too. You and your dentist can work together to increase your oral health. One of the first things noticed on the PRO 6000 is the SmartRing. It’s a 360 degree ring around the top of the toothbrush’s handle. It allows you to see feedback from the pressure sensor. That’s an option available in many of the Oral B toothbrushes. This toothbrush also alerts with a brushing timer through the SmartRing to let you know when you’ve brushed enough. You can program the sensor to flash with the color of your choice from 12 choices given. 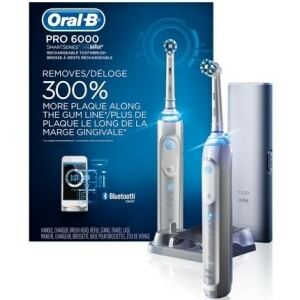 The Oral B app can be downloaded to your smartphone. Each upgrade to the Oral B line comes with more advanced technology in their app. It’ll provide real-time feedback on your brushing. That data can be brought to your dentist, too. There are more features with the 6000. There’s Focused Care. It’s a feature that can be implemented after your dentist has given you recommendations. It’ll help you focus on areas that were missed previously. Dental Care Journeys is another programmed feature for the app. The journey program programs goals into the app. If you want fresher breath, you can program Fresh Breath into the app. There’s also Plaque Fighter, Gum Health, Ortho Care, and Whitening as programmable options. There are modes of cleaning available with the 6000, too. There’s Daily Clean, which can be used twice a day or after every meal. The Sensitive Mode will work for those who have a problem with tooth pain. The speed is lowered. There’s Whitening for removing stains. Gum Care Mode will massage the gums to help fight gingivitis and sensitive gums. Pro Clean boosts the cleaning with a faster bristle speed. The 6000 also has a pressure sensor that will alert you to when the bristles are working too hard on your teeth. You should be allowing the toothbrush to do the work. Pressing too hard is what people have done for years with their manual brush. It’s unnecessary with the oscillating power of the Oral B. The 7000 has a brush head that is inspired by the brush you’d find in a dentist’s office. The CrissCross action alternates between the three rows of cleaning bristles. As the head rotates, the rows of bristles break up and remove plaque. It works on the tooth itself as well as below the gum line for a clean mouth. The bristles work at a 16 degree angle to remove 100% more plaque. There are 3 brush heads that come with the 7000. There’s the CrossAction brush mentioned above. There’s the ProWhite and Sensitive Brush Heads, too. Oral B offers 9 brush head options depending on your oral care needs. You could pick one for each member of the family, so you can use the same handle. Everyone’s needs can be met with the Oral B line. In the 7000 box, you’ll find the 3 brush heads as well as the SmartSeries Handle, premium charger, travel case, and SmartGuide. The SmartSeries handle has pressure lights, so you won’t overbrush. There are 6 modes for this toothbrush as well as a timer to ensure you brush for 2 minutes. That’s the time that dentists recommend to all their patients for good mouth care. The 6 modes include a Whitening Mode for a bright smile. There’s a Gum Care Mode for improved gum health. There’s Deep Clean Mode, which works for those who need a thorough cleaning. The Sensitive Mode is for those who need less power. Tongue Clean Mode will rid your mouth of harmful bacteria. Daily Clean is for everyday brushing. The Oral B app tracks your brushing habits over time and gives you statistics that you can take to your dentist. It’ll gather all that data into charts that give you a visual indication of problem areas. The app will provide real-time feedback, too. It’ll instantly tell you if you’re brushing too hard. The 5000, 6000, and 7000 from Oral B has many of the same great features because they’re crafted by the same company. There are distinct differences in the three brushes, though. The 7000 has the most cleaning modes of all brushes. 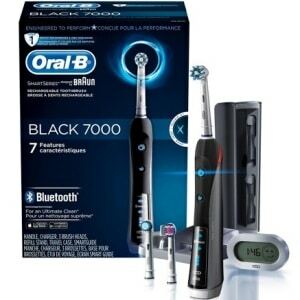 It has 6 modes compared to the 5 enjoyed by users of the Oral B 5000 and 6000. The Oral B 7000 adds a 6th mode with its Tongue Cleaning Mode. It removes tons of bacteria hiding out on the surface of the tongue. It’s a mode that helps to freshen breath and have a cleaner mouth after brushing. The brushes that come with each version are meant to focus on a certain area of oral hygiene. Whether it’s plaque removal, teeth whitening, or serious deep cleaning. Each brush head included with the brush handle are focused on obtaining their individual goals. The 5000 has a vibrating head that provides advanced plaque removal below the gum line. The 6000 uses a rounded brush head to remove plaque. The 7000 does what both the 5000 and 6000 focus on, but it does it with more finesse and more features. It cleans with a set of bristles on the CrossAction brush that are angled at 16 degrees. The 6000 and the 7000 have a 360 degree SmartRing to alert you to problems in your brushing in real time. All three brushes have the ability to synch with the app, but those two brushes will show you what’s going on when you’re not tracking with the app in real time. Out of the three brushes, the 6000 is the one with the most battery time. It has 12 days when the others have 10 days. The two day difference isn’t all that significant unless you’re planning on traveling. The 7000 comes with a SmartGuide. This device is a wireless companion for your brush. The others can be synched with a SmartGuide purchased separately. It doesn’t come with the toothbrush itself. With the 7000, it’s an added bonus that synchs with your brush handle for easy visual reference. Not everyone wants to get the app and use their smartphone in the bathroom while brushing every day. This can be kept right alongside the toothbrush for your convenience. All three of the brushes have a traveling case. They come with a charger and refill storage for the brush heads. The 7000 has a travel case with a USB charging port in it. You can easily travel with the case and not have to worry about where you’ll charge the toothbrush. It helps you ignore global voltage needs in various countries. The Oral B PRO 5000 and the Oral B PRO 6000 are the first toothbrushes we’ll compare. It’s tough to compare two Oral B PRO options because the company has a strong line of toothbrushes with all kinds of great features. First, let’s talk about the timers. Both the 5000 and the 6000 have the two-minute pro-timer. It ensures that you’ll be brushing your teeth for the perfect amount of time. It’s what’s recommended by dentists across the world. Most people underestimate the time that they spend brushing. This timer will never leave you guessing again. The next thing is the LED SmartRing. It’s available on the 6000. It lets you choose 12 colors for a personalized look to your toothbrush. You can choose the color you’d like it to turn when you’ve used too much pressure. The sensor can alert you with colors like red or blue. It’ll depend on your preference with the Genius SmartRing. The 6000 has a longer battery life than the 5000. The rechargeable Lithium-Ion battery in both brushes last for a very long time. The 5000 lasts for 10 days of normal brushing. The 6000 lasts for 12 days. You’ll get two more days with the 6000. Both toothbrushes come with their own focused heads. The 5000 has a FlossAction brush head included. While the 6000, it has a CrossAction brush head. They both have storage cases with chargers as well as travel cases. Given the choice between 5000 and 6000, it’s a close race. We’d pick the 6000 because it’s slightly better in a number of ways to the 5000. The technology is newer, and the company has made slight improvements to everything. 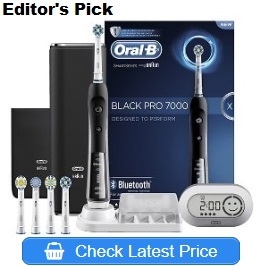 In the comparison of the Oral B PRO 6000 to the PRO 7000, it’s also a close race. The 6000 has 5 modes of cleaning. Those 5 modes are the Daily Clean, Sensitive, Gum Care, Whitening and Pro Clean. The 7000 has those 5 modes as well as an added bonus of the Tongue Cleaning Mode. The tongue cleaning will actually remove more bacteria from the mouth than other brushes. They both have a pressure sensor and a 2-minute timer. These are the features available for the Oral B products across the board from one toothbrush to the next. These two versions of the PRO also have the 360-degree LED SmartRing. It can have its colors changed through the app, too. The 7000 has an Oral B SmartGuide device with it. That’s an addition that the 6000 doesn’t have. The SmartGuide will give you information on its wireless device like whether you’ve completed each quadrant of your mouth. It’ll track whether you’ve brushed for the correct amount of time. As you brush, it’ll give you cues to performance. You’ll get a happy face when you’ve brushed for two minutes, but a sad one if you’ve brushed too hard. The addition of a SmartGuide means that you can leave this device in the bathroom to be used as needed. Everyone in the family might be using the same handle with different brush heads. Once the handle is powered up, the SmartGuide is triggered. You don’t have to worry about having your phone or the app handy. In terms of design, the 6000 has rubber on the back with a slick power and function button on the front. The 7000 has rubberized grips on both sides for better handling. The 6000 is only available in white while the 7000 is available in black and white. Out of the two, our choice is the 7000. It has more advanced features, and the addition of the SmartGuide, which we find incredibly handy. Even if the battery life is less with the 7000, it has a handy travel and USB charging case to make up the difference. Out of all three Oral B PRO toothbrushes, it can be tough to make a decision. All of them have Bluetooth apps for support and gathering data. You’ll be able to take the information to your dentist to go over the findings. Your dentist will be able to recommend new habits and things you should work on at home. The toothbrushes from Oral B all have a pressure sensor to ensure that you’re not pushing down too hard. The brush should be doing all the work. You don’t want to scrub your teeth or gums. It can lead to more serious problems like receding gums. When it comes to cleaning modes, the 7000 beats the others. It has 6 modes of cleaning compared to the others at 5 modes. The addition of the tongue cleaning mode will mean cleaner, fresher breath for the user. The 7000 has a SmartRing that can be changed with the app, but so does the 6000. While the 6000 has a longer battery life, we’re leaning towards the 7000 because it comes with a charger and travel case that isn’t available with the other models. If you’re going on vacation for 14 days, it won’t matter if you have 10 days or 12. You’ll need to have a charger with you. The 7000 has more features and additions than the others overall. You’re getting extras for your convenience and to ensure that you have a clean mouth. While we believe that the 7000 has better features and more choices, you might want to focus on your needs. If budget is a concern, you can always set your sights a little lower with less features. Oral B is a brand recommended by the American Dental Association. Even if you decide to go with the 5000, which has less features than all three, you’re still getting a great toothbrush. 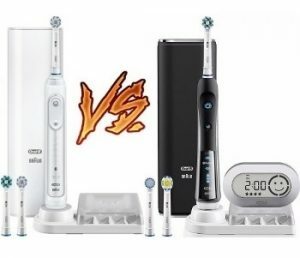 Oral B pro 1000 vs 3000: Which One is the Best? 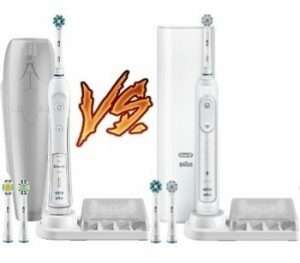 Oral B 7000 Vs 8000 – Which One is Better?